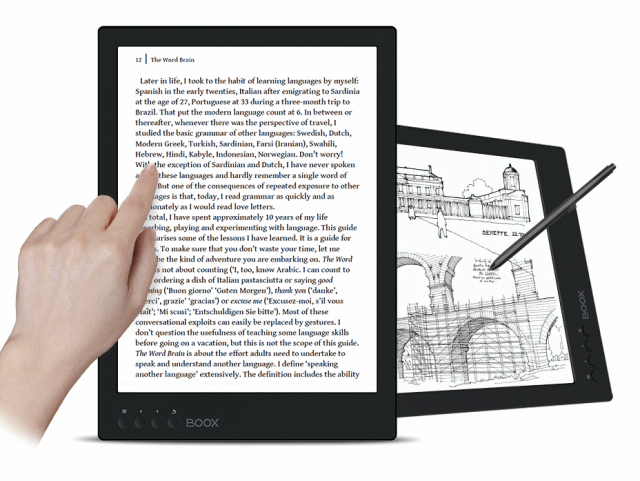 A new application has emerged for ereader devices that originally were intended for reading ebooks alone: they are also used as secondary monitors for PCs. So far, tech-savvy PC users have had to hack an ereader to plug it into a computer as a monitor, but now, the Onyx Boox Max 2 provides the feature out-of-the box. 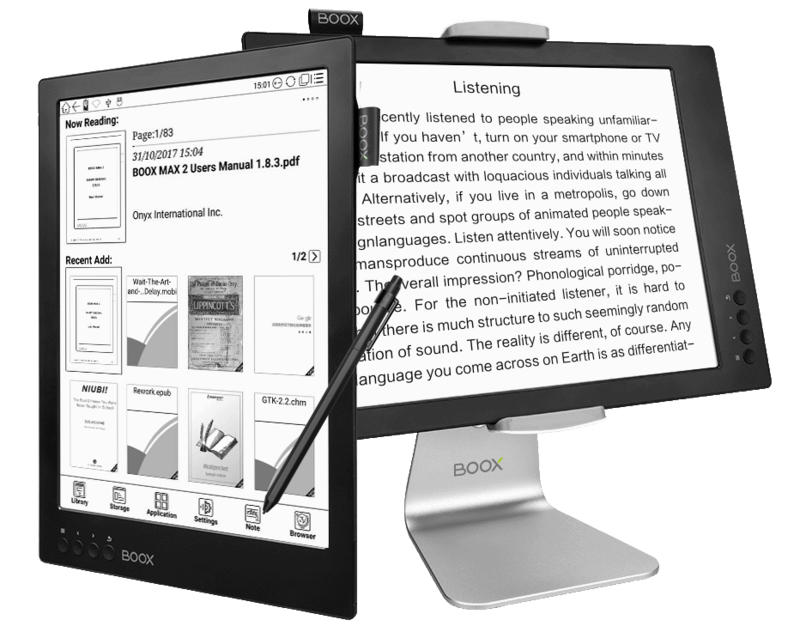 The Onyx Boox Max 2 is a big ereader with a 13.3-inch E ink screen. A device like this is optimal for reading PDF documents and PDF books (the product can open all common ebook file formats). 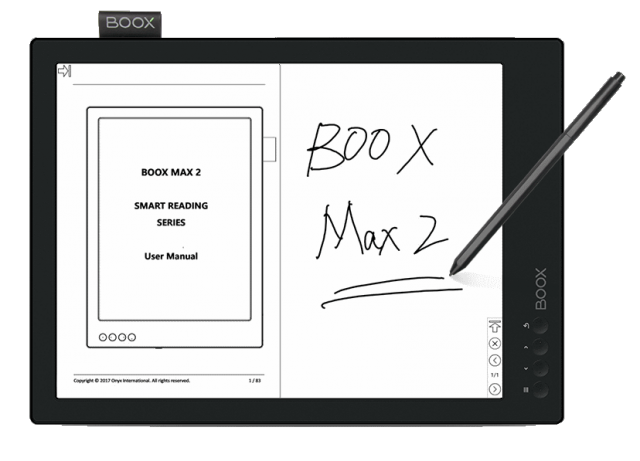 The Max 2 has been developed with this in mind – it lets users write and draw on the screen with a stylus. The device can also be used like an ordinary touch screen device by touching the screen with fingers. One more key feature that at the moment separates the Max 2 from competitive products, like the Sony DPT-RP1, is the HDMI port that lets you plug the Max2 into a PC and use it as a secondary PC monitor. People who stare a monitor their entire work day or can’t setup their PC displays for ideal lighting conditions, can greatly benefit from a E ink screen that doesn’t flicker and provides high contrast. It is, of course, a grayscale display without even the possibility to watch videos – perhaps an important feature for easily distracted workers. The Onyx Boox Max 2 is available in a few online stores for 800 Euros. The official Onyx stores are listed on the company’s web page. As the video and the reviewer’s reply to questions on YouTube indicate, there are some teething problems in the product that may cause problems for some users, but may not affect others. 13.3-inch E Ink Carta display. Made of plastic, it is light and flexible. Resolution 2200×1650 pixels, 16 levels of grey. Electromagnetic (WACOM) and capacitive dual touch screen. With the included stylus it is possible to write and draw on the screen. The capacitive layer allows touching and controlling the screen with fingers, just like using it as a tablet. Four buttons: Menu, Back, Next Page and Previous Page. 2GB RAM + 32GB of storage space. Android 6.0 operating system software. HDMI port for connecting the ereader to a PC as a secondary monitor. 3.5mm audio port for text-to-speech, playing music or audio books. Ebook and document formats: PDF, EPUB, TXT, MOBI, CHM, DJVU, HTML, RTF, FB2, DOC, PDB. Audio: MP3, WAV. 4100mAH lithium-polymer battery. Up to 4 weeks of standby time. 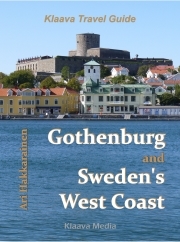 2017-12-09 by ari in Ereader. Tags 13 inch, Boox, E ink, ebook, Max 2, monitor, Onyx.